My life has been a little bit like this weather. It went from so hot it was hard to handle (end-of-the-year school business) to freezing (summer break). Yet, the reality is that there is never a spare moment to stop and smell the roses unless I make it happen. In fact, I was just getting ready to head to bed and realized that I needed to write this article. It made me think about how I need to take a moment, slow down and enjoy the time that I am given, which leads to this article. Growing up, I do not think that I understood the concept of time until about first or second grade. The only way I understood it was that there was a countdown until summer vacation and then once summer arrived, it never lasted long enough. However, it seemed like those summer days lasted forever. Starting at sun up through sundown, there was always something exciting happening. Often, I would be found at my grandparents’ farm doing everything from helping to being a menace to society. One moment my brother and I might be helping my grandpa load things, and another moment, we would have wandered off, distracted by a bug, bird or an animal of some sort. Some days, when everything was planted, Grandpa would plan a day of berry picking. I believe I have written an article about berry picking that brought a tear to my eye, but this is not one of those. So, with berry picking, Grandpa would drive the four-wheeler back into the largest patch of briars one has ever seen. From there, I would gently climb onto the front of the bike and pick berries while Grandpa made his way around the bush, braving the thorns and the poison ivy. I am pretty sure that on those trips I ate more berries than I ever picked. My bucket would always be half full while Grandpa’s bucket would be completely full. Then, we would compare buckets and guess whether we had enough for pie or cobbler. We would proudly ride back to the house, announcing loudly to Grandma that we had to bake now! Grandpa would drop me off with Grandma and our job was to make something delicious while he went to finish up whatever project that did not need little helping hands to enhance. For pie, Grandma would get out the flour, lard, cornstarch, sugar and whatever else we may have needed. To be honest, it probably was not much more. Grandma was a farm cook and cooked deliciously, heartily, but simply. If it was cobbler, it was sugar, flour, milk, butter, egg and some baking powder. The type of berry would determine what dessert was made. 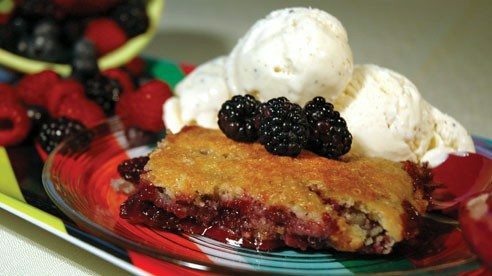 Blackberries often resulted in cobbler while elderberries were made into pie. To this day, blackberry cobbler is a favorite dessert of mine. Grandma and I would roll, stir, mix and pour the batter over, around or on top of the berries of choice. Then that entire mixture would need to head into the oven to bake for approximately 45 minutes to an hour. The smells emerging from the oven during that time are hard to put into words, but I am going to try. There was a sweet butter scent, a tart berry aroma, and all these combined to create the smell of summer – sweet but tart and utterly delicious. Once this emerged from the oven, then this bubbling creation of oozing berries and crisp crust had to cool. When Grandma took a big spoon and scooped out a hulking piece for Grandpa and me, all that waiting paid off. To this day, those scoops of pie and cobbler in the summer of my youth were some of the most amazing things to exist. They did not come easily; the berries had to be picked and washed, crust had to be made, there was the baking time and finally the cooling time. Yet it was in those moments that the best memories were made. Even 24 years later, I remember those moments, everything from the dew on the leaves of the berry bushes to the smell emanating from the stove as the dessert baked. It was not fancy, it did not cost a lot, but those memories are some of my most precious. So while summer may go by fast and there are lots of plans to be completed, remember that sometimes it is the most simplistic and patient memories that are worth the most. Submitted by Christen Clemson a member of the Trumbull County Farm Bureau, who has completed her doctorate at the Pennsylvania State University. She and her family farm in Mecca Township.